Tsavorite | Gemstones from A-Z at Rocks & Co.
Back Home Gemstone Information Tsavorite | Gemstones from A-Z at Rocks & Co. Discovered by Campbell R. Bridges, the legendary Scottish geologist, Tsavorite was first found in Zimbabwe, 1961. In 1967 Bridges found another deposit in Tanzania’s Lelatema Mountains although the political climate made mining impossible. Bridges was finally able to mine Tsavorite in 1971 when he found the gem in Kenya. A Green Grossular Garnet, Tsavorite is the trade name created in 1974 by Campbell and Tiffany's Henry B. Platt after Tsavo National Park in Kenya. This iconic name is wonderfully emotive, firmly connecting the gem with one of Africa's largest and most famous wildlife reserves. Tsavorite is a green member of the Garnet family. Alongside Andradite and Uvarovite, creating the Ugrandite group, Grossular is one of the calcium Garnets. While it comes in many colours, including various shades of brown, green, orange and yellow, Grossular Garnet gets its name from the Latin 'grossularia' for gooseberry due to the colour similarity of its pastel green varieties with the fruit. Apart from Tsavorite, other Grossular members include Hessonite (orange, sometimes with hints of red and brown, Mali Garnet (yellowish green to greenish yellow) and Merelani Mint Garnet (mint green). Tsavorite is coloured by the same elements found in Emeralds, vanadium and occasionally chromium. Vanadium and chromium are responsible for the level of green present in Tsavorite while yellow hues indicate iron is present. Although a pure Emerald green is considered of highest value, Tsavorite ranges in colour from bluish green to yellowish green, with intense middle tones being the most valuable. Tsavorite 'generally' looks better under the sun; incandescent light can 'sometimes' accentuate yellowish or greyish tints. A well-cut Tsavorite is remarkably bright and sparkling with a crisper brilliance when compared to sleepier Emerald's 'satiny' brilliance. This is caused by three factors. 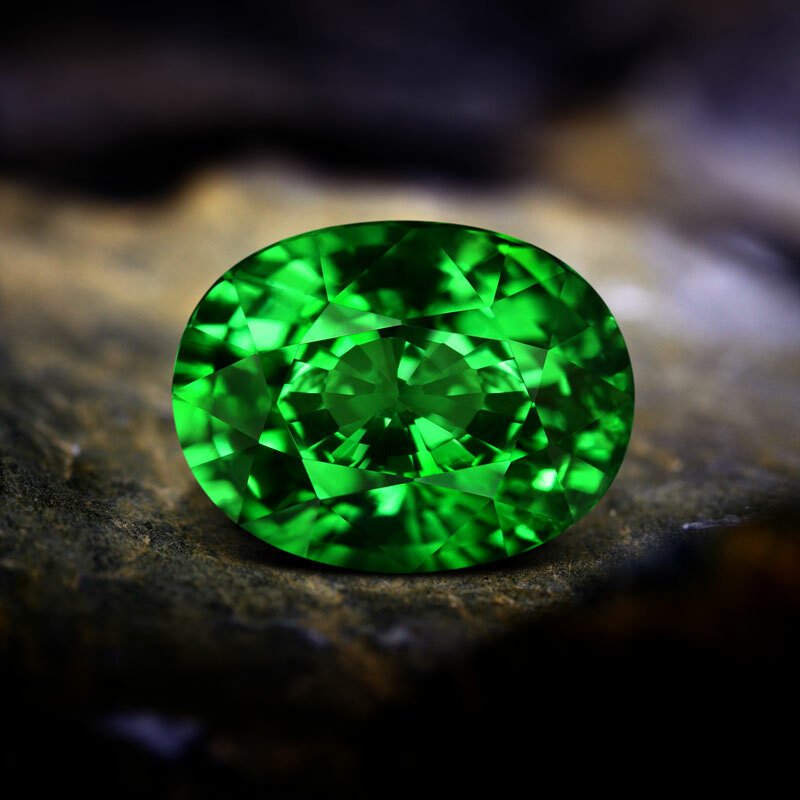 First, Tsavorite has a higher refractive index than Emerald, meaning light entering Tsavorite is bent at a greater angle than light entering Emerald. Second, Tsavorite has double the fire, the splitting of light into its component colours. Third, Tsavorite's single refractivity adds intensity to its colour communication. 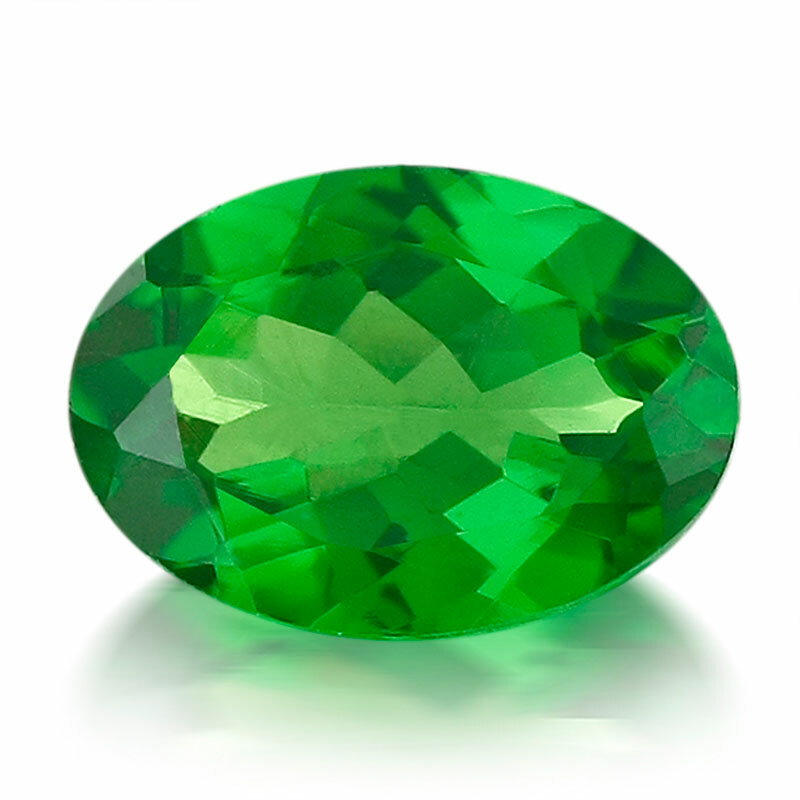 Despite being classed as a Type II gemstone, Tsavorite should be eye-clean (no visible inclusions when the gem is examined 15 cm from the naked eye) or as close to that ideal as possible. 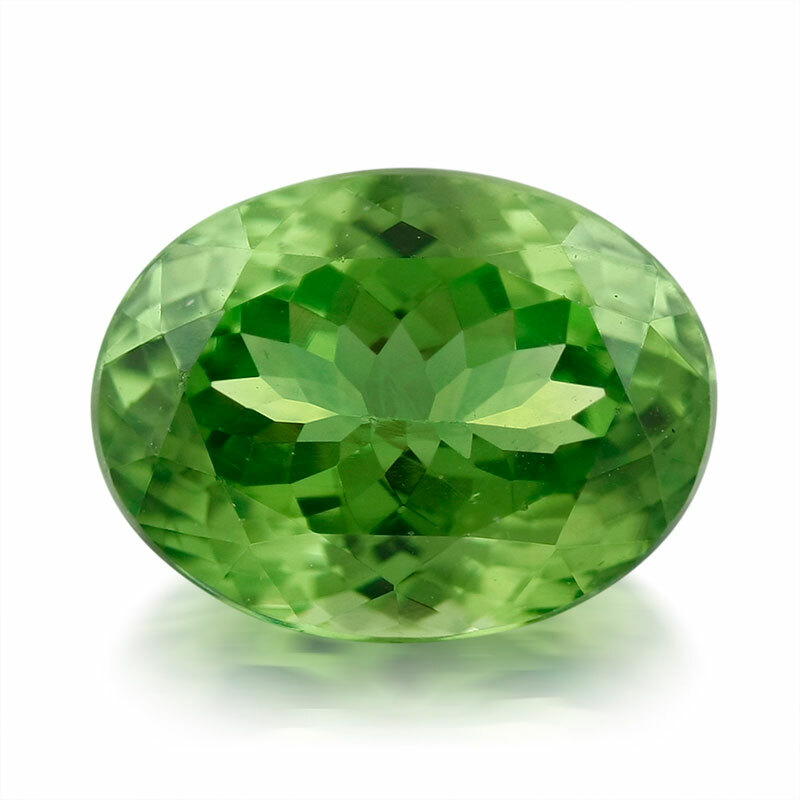 Tsavorite is also more durable and is one of the few gemstones that is never treated. Tsavorite is an example of a gem whose’ rarity has jeopardised its commercial viability. There are only a handful of its notoriously difficult to mine deposits in Kenya (Tsavo and Turkana), Tanzania (Merelani, Lemeshuku, Tunduru and Ruangwa) and Madagascar (discovered in 1991 near Gogogogo village and near Behara village in 1997), keeping prices high.